Well, Lottie's caught me by surprise, her season started today, almost 3 weeks earlier than expected. Just as well I got her new eye test done last Friday. She's booked in at the vets on 30 Aug so I can get a blood sample drawn to take over to Idexx in Wetherby for progesterone testing, then it should be a 'all systems go'. Lottie's had her first herpes vaccination today. 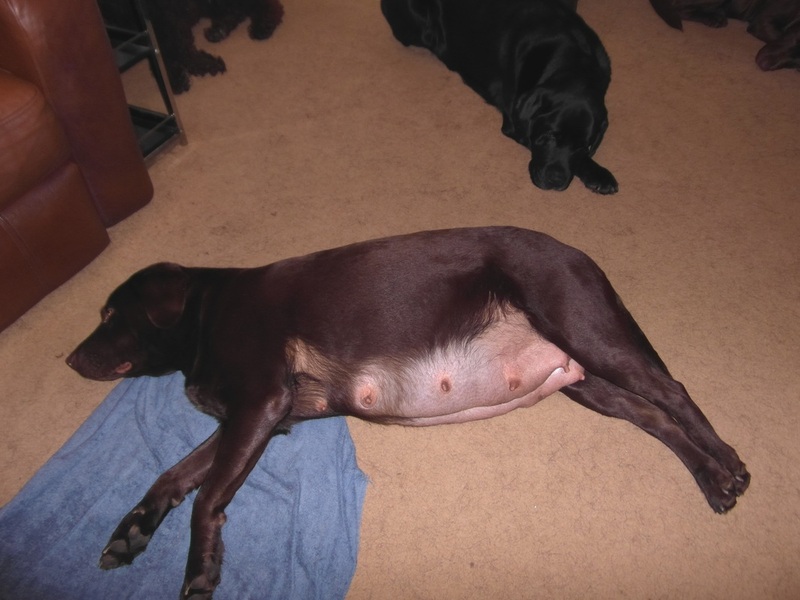 The 2nd one will be done 7-14 days before her litter is due. The blood sample is now with Idexx and I should get a call later on today to let me know the results and whether or not I need to take her to the stud dog. She's been flirting quite a bit with Will in the last couple of days (he is, of course, neutered) which is a good sign. A first mating this evening. No messing about and straight to it with a 20 minute tie. A second mating this evening so now all there is to do is sit back and wait. I'll be getting Lottie scanned at around 5 weeks so until then I just need to be patient. 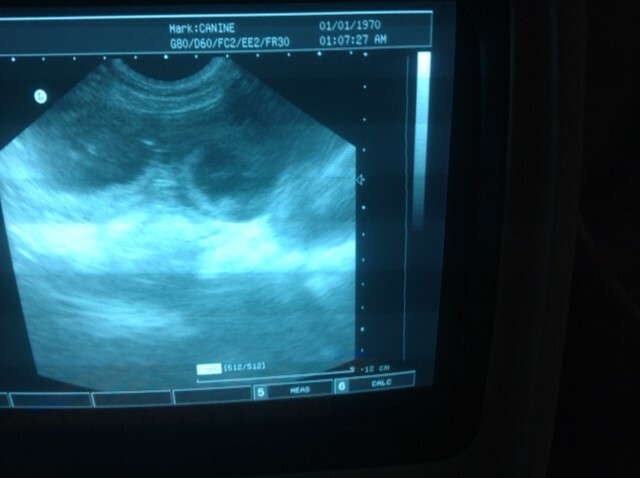 Not really much to report yet other than Lottie is booked in for a scan late afternoon on 5 Oct.
Lottie's had her scan today and there are most definitely puppies on the way <big grin> You should be able to count at least 5 blobs on the screen, all of them puppies. Ignore the date and time on the scanner, Lottie and I didn't really travel back in time. 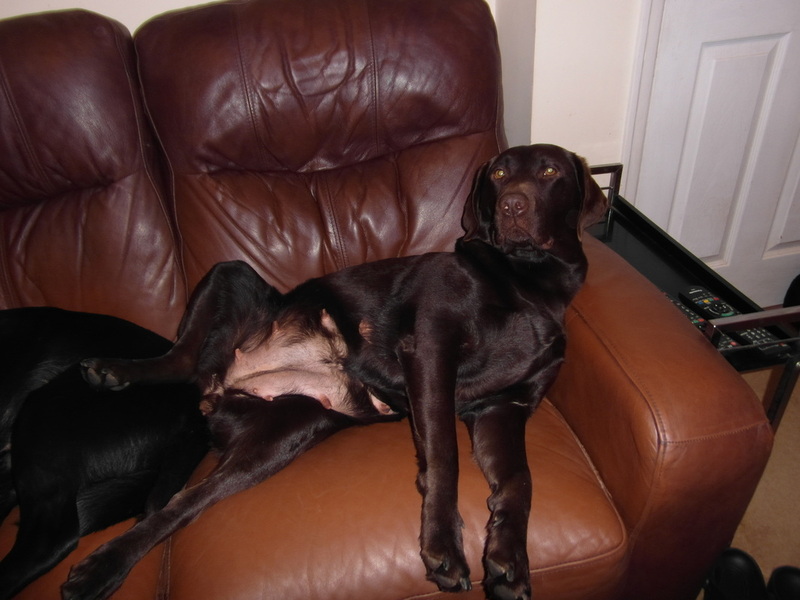 Lottie relaxing on the sofa this evening. You can see her 'puppy bulge' is starting to get bigger. During the past week I've been gradually changing Lottie over to the puppy food the puppies will be weaned on. In the last couple of days I've also started to increase her daily food allowance, giving her a midday meal. Today she's had her 2nd herpes vaccination and the vet was very pleased with her condition (though Lottie wasn't too impressed with having her temperature checked). The new whelping box base arrived today and the rolls of vetbed are waiting to be cut into pieces that will fit in the washing machine - all I need is a dry but windy day to get it on the washing line. This latest photo was taken this evening and you can see the difference from the one taken 10 days ago. 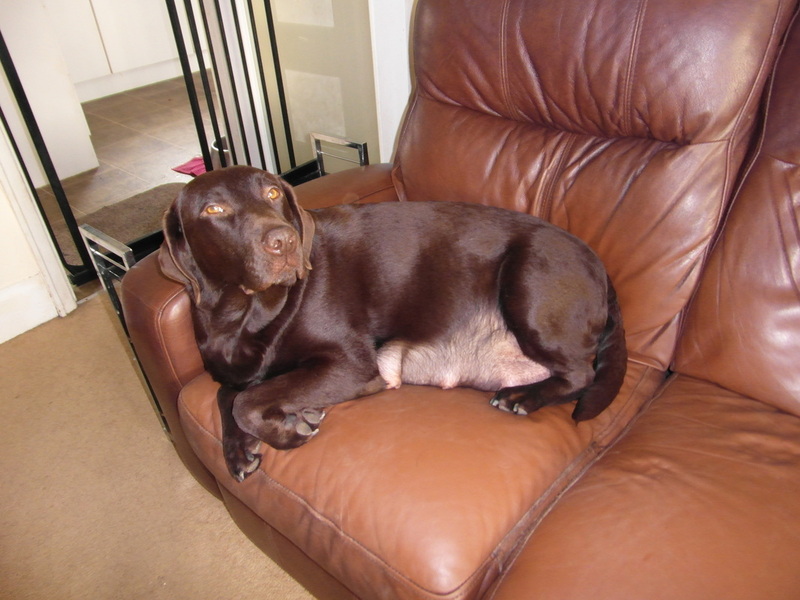 Only a few days to go until Lottie's due date and she's the size of a beached whale. The whelping box is in place, the torch is charged (in case she decides to have any puppies in the garden at night) and the car has plenty of petrol in the tank in case we need to go to the vets. What a stressful few hours. Lottie's first puppy was born at 3.45pm yesterday afternoon but after a further 2 1/2 hrs the second puppy still hadn't been born. I decided a trip to the vet was necessary and puppy no 2 was born in the back of the car on the way there. To cut a very long story short, we stayed at the vets until 1.30am with intermittent births throughout the stay, then came home, knowing there was at least one more pup still to be born. The last puppy finally put in an appearance at 4am, a miraculous 12hrs after the first one. If anyone in the Halifax area saw a mad looking woman and a chocolate Labrador running up and down the streets in the early hours, it was me with Lottie, in the hope that the exertion would get things moving.